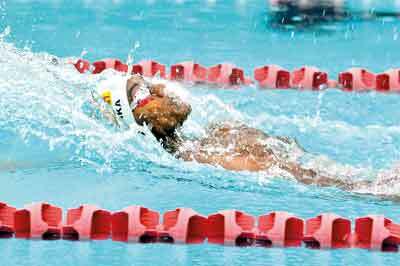 Haren Nugawela of Wycherly International was the star of the first day as he established two new records at the 23rd Inter-International Schools’ Swimming Championship 2017 commenced yesterday at the Sugathadasa Swimming Complex. A total of nine new records were established on Saturday. Haren who won the boys 16 and over 100m backstroke with a record time of 1:00.39mts, clocked 53.15secs in the boys 16 and over 100m freestyle. In an event organised by the Asian International School with Milo, Glitz and Morison’s Lacto as sponsors eight hundred and fifty nine athletes from nineteen international schools took to the blue waters in exhibiting their prowess. Fifty seven events were worked off yesterday where Lyceum Wattala timed the best to occupy the first spot in thirteen events while their athletes finished in 2nd and 3rd in 22 events. The interesting feature of the day was the first three swimmers in the boys 16 and over freestyle event including Haren Nugawela improved the existing record established by Kavin Weerasinghe. The record established last year was stood at 55.22secs. The meet ends today.